1837: King William IV, who reigns as king in both the United Kingdom and Hanover, dies. In the United Kingdom, the new sovereign is his niece, Victoria, daughter and only child of his younger brother, the Duke of Kent. But the succession in Hanover is governed by Salic Law, under which a woman cannot reign unless there are no living male heirs to the throne -- and Victoria has three uncles and two male cousins behind her in the line of succession. Her uncle, the Duke of Cumberland, becomes King Ernst August I of Hanover. One of his first acts as king is to make a claim on a number of pieces from the British royal jewel collection, claiming that pieces that belonged to his mother, Queen Charlotte, now belong to him as the head of the House of Hanover. 1839: King Ernst August files in chancery court to reclaim any and all of the jewels bequeathed by family members to the House of Hanover. The claim is complex. Identifying which jewels belonged to Queen Caroline in particular will prove difficult, as diamonds from old pieces have been used frequently in the making and remodeling of various pieces of royal jewelry by Queen Charlotte and Queen Adelaide. As a tribute to all of you lovely people born in June, today I'm bringing you my top ten list of royal brooches set with your birthstone: the pearl. Pearl and diamond brooches are something of a staple for most royal women, and there are lots of them in circulation. These are my favorites -- be sure to chime in with your top ten list in the comments below! The design of this brooch, with three pearls set in a horizontal bar, may be simple, but its history is rich. The brooch originally belonged to Princess Louise Margaret of Prussia, who married the Duke of Connaught (a son of Queen Victoria and Prince Albert) in 1879. She gave the brooch to her daughter, Princess Patricia, who wore it on her wedding day. In turn, Patricia gave the brooch to her great-niece, Queen Margrethe II of Denmark, as an eighteenth-birthday present. Margrethe wears the brooch regularly, sometimes pinning it to her hats or her gowns. Our friends over at Luxarazzi, one of the best blogs for news about the royals in Luxembourg and Liechtenstein, are kicking off a grand tiara competition today, where you can pick your favorite tiaras and vote for them in head-to-head competition, March Madness-style. Because I am so very fond of royal jewelry, I was asked to provide a little color commentary for the tiara race, handicapping the field and predicting possible winners. Hop on over to see my picks, and get ready to vote for your favorites! There's nothing unusual about seeing the Queen wearing pearls. Indeed, she wears pearl and diamond earrings and a three-stranded pearl necklace at nearly every daytime engagement she attends. 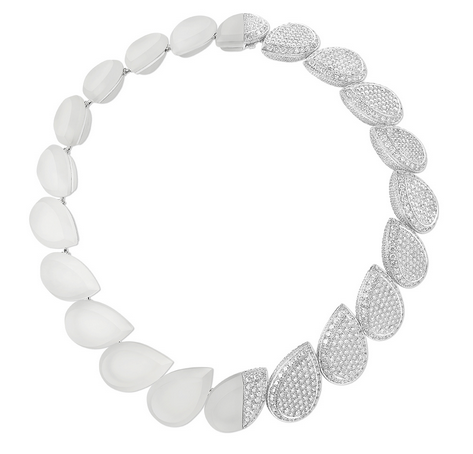 But one of the lesser-seen necklaces in her collection is the four-stranded pearl choker necklace with an unusual diamond clasp. 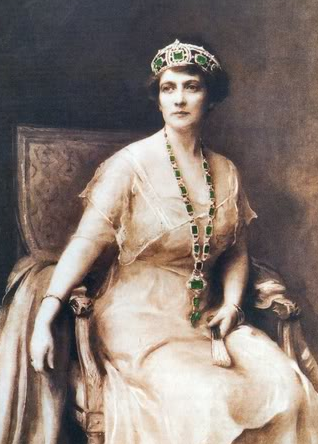 Leslie Field writes that the necklace was made "from pearls in [the Queen's] collection." The pearls were reportedly a gift from the Japanese government, possibly acquired during the 1970s, when she made a state visit to that nation. 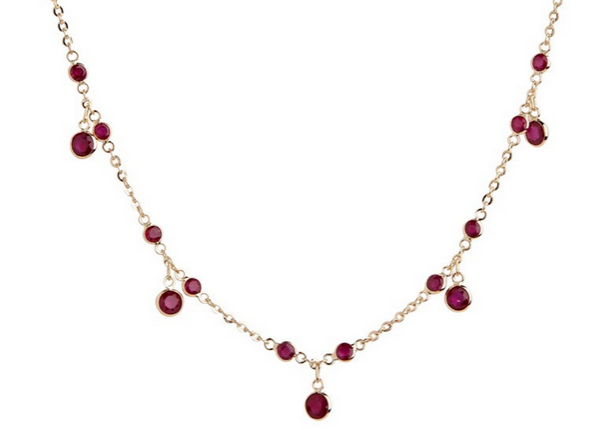 The necklace was constructed by Garrard. Field also speculates that the clasp of the necklace is large enough to accommodate an additional strand of pearls, should the Queen ever choose to make this a five-stranded choker. Search all Tiarapedia entries alphabetically, by country, or by jeweler! The German state visit continued this week with even more brooches on display. Let's dig in! The second full day of the state visit started off with engagements in Frankfurt. The Queen wore another brooch that we recently saw at Royal Ascot: the diamond and emerald shamrock brooch that many believe was a gift from the Sultan of Oman. More New Jewels for Charlene! The stunning pair of ruby and diamond earrings that we discussed here last week aren't the only new jewels to have been worn recently by Princess Charlene of Monaco. At the Monte Carlo Television Festival, she also donned a new pair of diamond earrings. 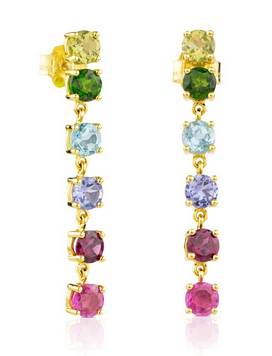 Like the ruby and diamond earrings, these earrings are reportedly by Graff. That provenance was stated here; the blogger also notes that the earrings are valued at around a million dollars. We're having quite the tiara-filled week here at the blog -- first Queen Elizabeth II's state visit to Germany, and now tiaras from the royal families of Luxembourg and the Netherlands. Let's start with a look at the sparklers from the National Day Gala in Luxembourg, shall we? For this year's gala, Grand Duchess Maria Teresa selected a tiara that belonged to her late mother-in-law: the Belgian Scroll Tiara. Hereditary Grand Duchess Stephanie chose one of my favorites from the entire Luxembourg collection, the Grand Duchess Adelaide Tiara. I'm exhausted just thinking about the Queen's work schedule, and I'm nearly sixty years younger than she is! After a jam-packed week of events in Britain, Elizabeth and Philip jetted off to Germany for a state visit. Let's have a look at the jewels from their first two days on German soil. When the Queen deplaned in Berlin, she arrived wearing a major British heirloom jewel that was a gift from a German prince. The Albert Brooch, which features a large sapphire ringed with diamonds, was given to Queen Victoria by her husband-to-be, Prince Albert of Saxe-Coburg and Gotha, as a wedding present in 1840. The Queen wears it frequently, including an outing last week at Royal Ascot. When Princess Sofia of Sweden arrived at her royal wedding wearing a tiara made of diamonds and emeralds, jewel watchers gasped over the fact that the Bernadotte collection finally includes an emerald tiara once more. But although the Swedish royals lost their major emerald parure decades ago, the collection does still include a number of emerald pieces. 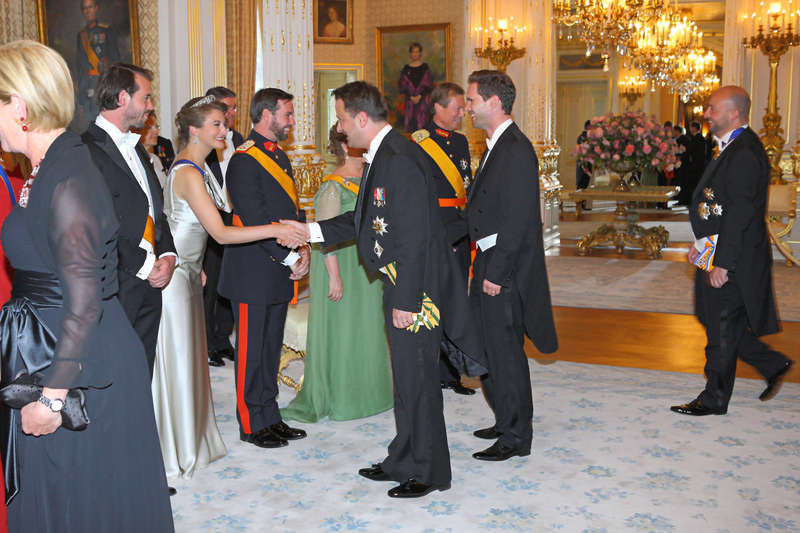 The Bernadotte jewel foundation holds an important demi-parure of emerald and diamond jewelry. The three-piece suite once belonged to the first Bernadotte king, Carl XIV Johan. It consists of a large necklace that was originally worn as a belt, plus two brooches. The larger brooch was originally a belt buckle. 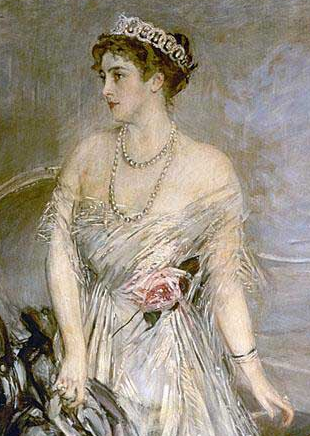 Above, Princess Sibylla wears the necklace and the larger brooch with the Connaught Diamond Tiara. Can you believe it's already been a year? 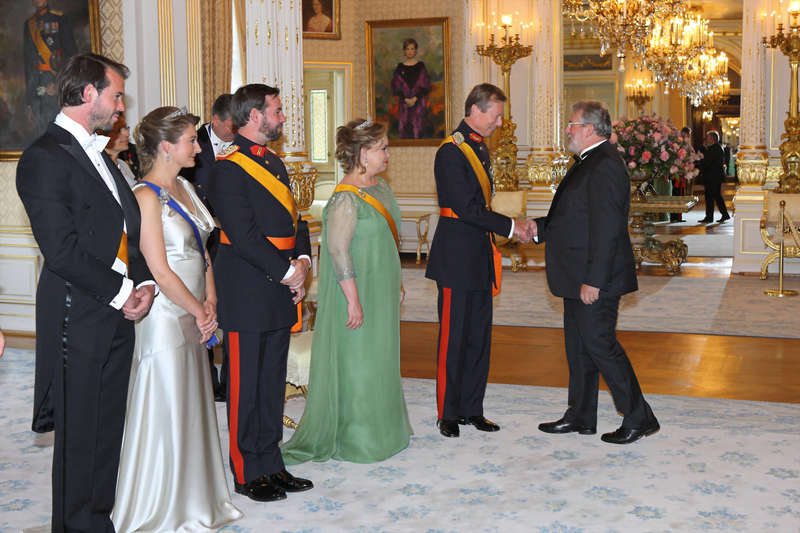 On June 19, 2014, the Prince and Princess of Asturias became King Felipe VI and Queen Letizia of Spain. During her first year as queen, Letizia has provided us with some glittering jewel moments -- and a whole lot of colorful earrings. Let's have a look at some of her memorable jewelry appearances during the first year of Felipe's reign. "Mrs. Leeds's Jewels Astonishing Paris"
PARIS, June 22 -- The society sensation of the present season here has certainly been Mrs. William B. Leeds , with her marvelous gowns and jewels. The latter embellishment of the youthful widow's beauty has caused the greatest astonishment in Paris society, especially when her wonderful collection of emeralds was recently increased. To the well-known tiara and necklace of these stones she has now added a superb stomacher, bought at Cartier's for $140,000 . The dazzling array of emeralds in the possession of Mrs. Leeds is now estimated by experts to be worth a good deal over a million dollars. They include many stones believed to be unique for size and perfection of quality. Mrs. Leeds's apotheosis took place at a magnificent dance and cotillion just before she left Paris for London on her way back to America. It was an extremely exclusive affair, the guests not numbering more than 150. A striking feature was designed to be the cotillion favors. For the first time, hats by Rue de la Paix milliners were distributed, as well as specially prepared cameras and gold match boxes for the men. When Mrs. Leeds, however, entered the room, almost covered with the world's finest emeralds, other guests held their breath, and from that moment everything else was thrown into the shade. The elaborate and costly gowns and jewelry of other women guests, which would otherwise have been widely discussed, passed almost unnoticed. At Royal Ascot on Friday, Zara Phillips was photographed wearing a glittering pair of round earrings. It turns out that the earrings are something special: a part of Zara's new line of jewelry. 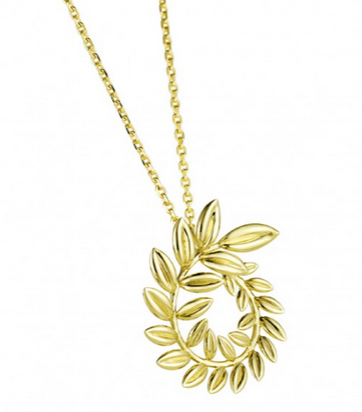 The Zara Phillips Collection is a collaboration with John Calleija, an Australian jewelry designer. The pair officially launched the new collection on Thursday in London. The umbrellas were out for the final day of this year's Royal Ascot, but there were still two royals (and one royal-adjacent) wearing a bit of sparkle. The Queen was vibrant in orange for the last day of the races, pairing her usual pearl jewelry with a brooch that honors Scotland, where she will soon spend several weeks on holiday at Balmoral. On Thursday, the Duke and Duchess of Wellington held a black-tie banquet at Apsley House to mark the 200th anniversary of the Battle of Waterloo. And there were tiaras! The Duchess of Cornwall wore her Old Faithful tiara to the banquet: the Greville Tiara, also known as the Boucheron Honeycomb Tiara. 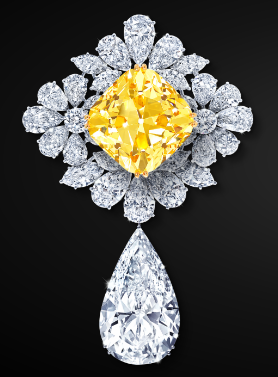 It was one of the many jewels that came to the Windsor collection as a part of the Hon. Mrs. Greville's bequest to the Queen Mother. Day Four of Royal Ascot is generally when the royal attendance begins to seriously slow -- but boy, do we have an especially exciting cast of characters to examine today! The Queen wore an interesting brooch on her yellow coat: the Botswana Sorghum Brooch, which she wore in public for the first time last year during her state visit to France. This week, royals from Europe have been remembering the 200th anniversary of the Battle of Waterloo, in which a coalition of soldiers from Britain, the Netherlands, and Germany defeated Napoleon Bonaparte's French army. The battle took place in present-day Belgium, although at the time the land was Dutch territory. On Wednesday, royals attended a re-opening ceremony at Hougoumont Farm, a key location in the battle. As she often does when attending military events, the Duchess of Cornwall wore the badge of the Lancers, the regiment that her father, Major Bruce Shand, fought with during World War II. Camilla paired the badge with her usual diamond and pearl earrings and a three-stranded pearl necklace. The Queen was all smiles for day three in a minty green outfit, with her Diamond Shamrock Brooch pinned to her lapel. The piece features a cluster of three diamond shamrocks gathered by an emerald ribbon. Last weekend, Princess Charlene of Monaco debuted a brand-new pair of earrings during the annual Monte Carlo Television Festival. The earrings, which look to be set with rubies and diamonds, were a welcome change of pace from the often understated jewels worn by Charlene. And we're off to the races again for the second day of Royal Ascot 2015! For the second day in a row, the Queen wore an important Victorian brooch to the races. This one is the Albert Brooch, a large sapphire ringed with diamonds. It was Prince Albert's wedding present to Queen Victoria, and she wore it during their marriage ceremony in 1840. Good news, everyone: you don't have to be royal to wear a tiara. In fact, tiaras have always been accessible to everybody -- as long as you have the money to buy one and a place to wear it. Plenty of non-royal guests sported tiaras at Prince Carl Philip and Princess Sofia of Sweden's recent wedding. Here's a look at some of the diadems on display. Get excited, everybody! It's the most wonderful time of the year again: Royal Ascot, AKA HAT CHRISTMAS! Let's have a gander at the millinery and bejeweled wonders on display, shall we? The Queen wore pink for Day 1, which is always good, but even more thrilling is the fact that she debuted a brand-new brooch! And even better? It's a major British heirloom. The Crown Ruby Brooch originally belonged to Queen Victoria; it was set with opals instead of these enormous rubies when it was made by Garrard in the 1850s. The brooch was later altered, and the opals were replaced. It was worn by Queen Mary, and then by the Queen Mum. Today was the Queen's first-ever public appearance in this important brooch. So exciting! On Monday morning, the British royals gathered for the annual Order of the Garter service, where we saw some regular bling on some of the Windsor women and immense, chivalric glitter on everybody else. Here's a bit of background on the order and its insignia. Now, let's get to the pictures! The Queen wore Queen Victoria's Pearl Drop Earrings with her Garter finery. The earrings feature large pearl drops suspended from diamond studs. They were a gift to Victoria from Prince Albert. Time for a rundown of the other big royal event of the weekend: Trooping the Colour! No surprise here: the Queen chose the Guards Brooch for her birthday parade. She's worn it at every Trooping the Colour ceremony since the late 1980s. Time for part two of our look at the jewels of Prince Carl Philip and Princess Sofia of Sweden's wedding! 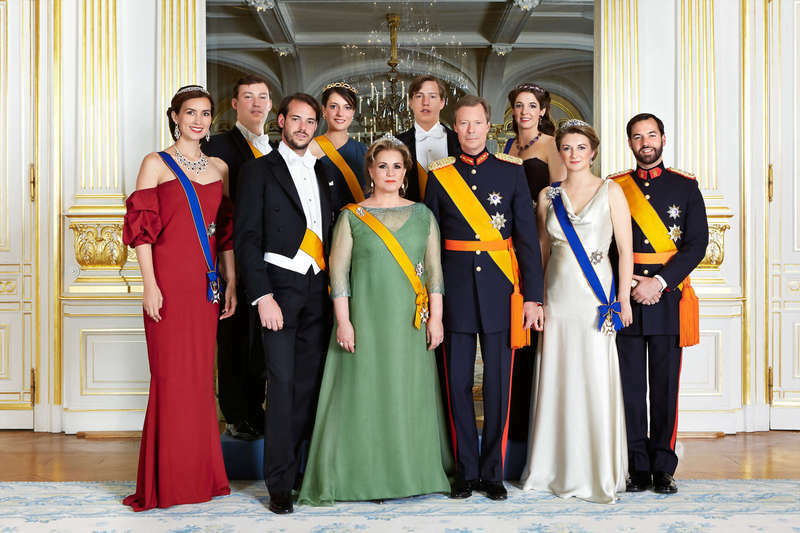 This time, let's take a gander at the jewels worn by the foreign royal guests. Queen Sonja of Norway wore the full version of Queen Maud's Pearl Tiara (Version 2.0). We're still slowly working through the weekend's royal jewels as I make my way back to America. Today, we're looking at the jewels worn on the wedding day. This post is part one; part two will be up later this afternoon. 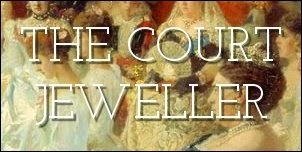 Enjoy, and stay tuned soon for a look at the jewels worn across the channel by the Brits during this very busy royal week! The last Swedish royal wedding of a generation was held in Stockholm on Saturday, as Prince Carl Philip, son of King Carl XVI Gustaf and Queen Silvia, married Sofia Hellqvist. The bride wore a brand-new tiara for the wedding, reportedly a gift from the king and queen. 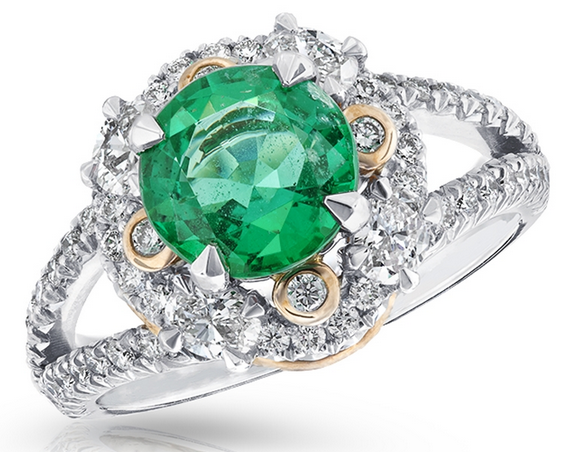 It features a diamond base topped by a series of emeralds. Hi, everybody! I'm slowly but surely getting caught up again here -- in fact, as you read this, I'm probably somewhere over the Atlantic -- but here's the first of our catch-up posts on this weekend's royal wedding! Prince Carl Philip and Sofia Hellqvist celebrated on the night before their wedding with a pre-wedding dinner aboard a boat in Stockholm. Let's have a look at the jewels, shall we? The bride mostly let her blue gown do the sparkling, wearing very little jewelry. Note: From Friday, June 5 until Sunday, June 14, I will be traveling and will be away from my computer. For notes about how this will affect the blog, especially commenting, visit here! The big day is finally here: Prince Carl Philip of Sweden will marry Sofia Hellqvist in Stockholm! Now it's time to guess which bridal tiara she'll be wearing. Will it be the Cameo Tiara, the traditional Bernadotte bridal diadem? Will it be another tiara from the collection? Will Sofia wear a new tiara, or no tiara at all? What tiaras do you hope to see the guests at Prince Carl Philip and Sofia Hellqvist's wedding wearing on the big day? Be sure to register your guesses for each of the following guests, and consult the Tiarapedia's indexes for helpful lists of tiaras! A full, updated list of confirmed guests can be found over here, and all of our posts on the Swedish royal wedding are available here. Check back here tomorrow for a post with a poll about the bride's tiara! For two centuries, the Bernadotte dynasty has reigned in Sweden, and the family has long had a tradition of grand royal weddings. Sofia Hellqvist will join the ranks of Sweden's royal brides this weekend. Here's how brides have married in the Swedish royal family from the early years of the twentieth century until today! 1905: Prince Gustaf Adolf of Sweden (later King Gustaf VI Adolf) married Princess Margaret of Connaught, a granddaughter of Queen Victoria and Prince Albert, at St. George's Chapel on the grounds of Windsor Castle. The pair met and fell in love in Cairo, and the Khedive of Egypt sent a romantic diamond tiara to the couple as a wedding gift. They would have five children before Margaret's untimely death at the age of 38.